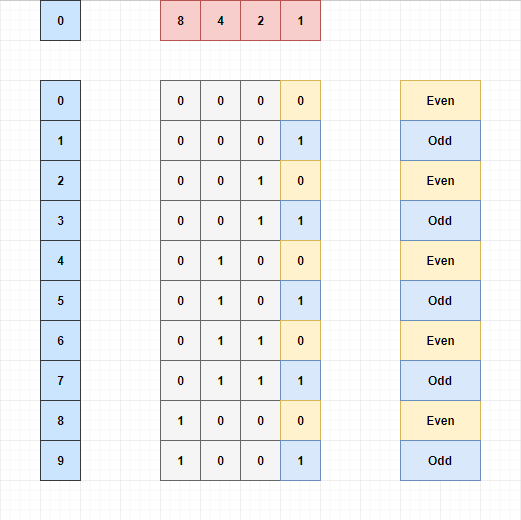 We can solve the odd or even problem more efficiently using bitwise operators. Let’s represent numbers in binary format and we will find some logic to solve this problem. LSB of even number is 0. Now, all we need to do is, just check the LSB of a number. If it is 1, it is Odd number. If it is 0, the number is even. Using Bit-wise AND operator, we can check whether the LSB is 0 or 1. Let’s take number 10. We have to check whether the LSB is 1 or 0. We need to create a bit mask with LSB bit as 1 and all bits are 0. Because we are going to check only the LSB bit. if result is 1, it is an Odd number. else, it is an even number.